Pain can be a formidable foe. 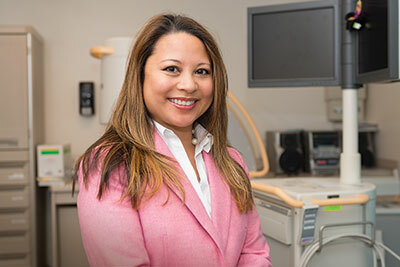 Just ask Cynthia Peña, M.D., who has made it her mission to help people suffering from all kinds of pain, from the nagging and intermittent to the chronic and debilitating. Her original focus, medically speaking, was anesthesiology, but she realized early on that she craved more interaction with patients. She’s been with the Center for Pain Management for six years, and has embraced the team approach in caring for her patients. The “team” includes physicians, nurse practitioners, a case management nurse, nutritionist, physical therapists and other rehabilitation professionals—to help patients heal the body, mind and spirit. Some of the tools in their kit include physical therapy and body conditioning, medication, anesthetic injections, counseling, massage, relaxation and biofeedback. Because everyone’s pain is unique and individual, so is their treatment, she says. Her patients run the gamut, from those recovering from surgery, to those dealing with end-of-life issues. Dr. Peña focuses on interventional pain management, which uses minimally invasive techniques to relieve, reduce or manage pain. Techniques include fluoroscopic imaging, spinal cord stimulation, steroid injections, nerve blocks, and radiofrequency ablation. Pain management also includes treatments such as physical therapy, medication management, and behavior modification. Plans call for a Pain Management Essentials program to be offered in 2014. For information, or to schedule an appointment with Dr. Peña, call the Center for Pain Management at (707) 646-4666. Consistently take medications as your health provider prescribes them. Stretch at least one to two times per day. Maintain nutritious eating habits and a healthy weight. Pain prevention is your goal. For example, take your medications on time and avoid overexertion. Investigate different approaches to controlling pain such as massage, acupuncture, osteopathic manipulation therapy, functional treatment programs, biofeedback, meditation and relaxation therapies. Learn how to manage stress, anxiety and depression. Think positively and surround yourself with positive people.